Discover traditional Greece on this relaxing cruise around the quiet coves and harbours of Evia. Greece's second largest island is only a stone's throw from Athens and yet surprisingly it remains a hidden gem. Aegean Sea - Swim and snorkel every day in the warm, azure waters and look out for sea life in rocky coves. Our trip begins at Athens International Airport at 7pm and from here we travel by bus to the port of Rafina or Marathon where we catch a ferry to the island of Evia. On arrival it is a short taxi or minibus ride to Karystos where our caique is moored. Before settling into our cabins we meet our friendly boat crew and enjoy a welcome drink. The MV Isidoros II is a traditional family-owned wooden caique with just eight guest cabins that Explore exclusively charters. The caique is listed as a historic vessel and there are fewer than 80 of this iconic Greek designed boat left in existence, so being able to stay aboard is a real treat. It was built in 1962 and was originally used as a cargo ferry before being converted in 1974 to the comfortable passenger cruiser it is today. Our boat has a large sundeck and a comfortable galley for meals. There is a bar where you can purchase a range of local wine and beer, spirits and soft drinks. There is also a boat ladder and snorkelling equipment available on board to make the most of the many swimming opportunities. All of the cosy cabins are en suite with windows and large fans and there is complimentary Wi-Fi on board. Our boat has a real home from home feel and you are free to move around as you please. You can even choose to sleep on deck under the stars if you wish to enjoy the clear night sky and cool night breeze. Evia is one of the largest Greek islands, but still remains off of the main tourist trail. In summer and on the weekends you'll find the main visitors are the Greek's leaving the city of Athens to enjoy the waterfront tavernas and uncrowded beaches. Visiting Evia is therefore a very authentic local experience. The rugged coastline is dotted with market towns, fishing villages, secluded coves and wide sandy beaches. The sea is clear and warm, making it a wonderful spot to swim and snorkel. The pine covered hills provide the perfect backdrop and also help to keep the evenings temperatures cooler. Please note that the order of the itinerary and inclusions may vary due to weather and cruising conditions. This trip is all about relaxing, swimming, eating and enjoying the beautiful scenery. On most days our boat will start cruising at around 9am and our boat crew will be ready to serve breakfast in the galley up to 11am, so there's an option to suit both early risers and those that prefer a lay-in. When we're cruising we'll make frequent stops for swimming and snorkelling. We'll then have time for lunch at around 1pm and normally reach our night mooring spot by around 4pm before heading ashore to enjoy an evening at authentic seaside tavernas. Food and drink is a major part of our journey and you certainly won't go hungry. Our boat crew will go out to local markets to buy fresh ingredients for our breakfasts and lunches on board the boat, so what we eat will depend on what's in season. Our hearty breakfast will normally include fresh bread, cheese, ham, eggs, cereals, Greek yogurt, honey, marmalade and fruit. Washed down with orange juice, coffee? or tea. Our boat crew will also serve complimentary tea and coffee? with tasty biscuits and cake every day at around 11am and 5pm. Lunch is normally a freshly prepared hot meal such as oven baked fish accompanied by seasonal salads and traditional appetisers and followed by a platter of fresh fruit. Each night of this trip our leader Thanos is keen to show us Greek hospitality and great food in one of the waterfront tavernas. There are excellent choices of evening dinners on every night of our trip which include barbecued seafood and various meats alongside traditional vegetable dishes. This truly is a great trip for food lovers. En route to our mooring spot in Panagia we will stop for a cooling swim or to snorkel in search of the local marine life. If you prefer you can always remain on board the boat. The outdoor area at the bow of the boat is covered by canopy providing shade perfect for sitting with a refreshing drink and a good book or there's the cool indoor galley if you prefer. On the top deck is an area perfect for sun bathing and mats are provided here for you to lay in comfort. Panagia is a small fishing village lying in the shelter of a scenic fjord. Little has changed here since the 1960s so it feels like a bit of a time capsule and let's you experience the laid-back Greek lifestyle and to stroll along the seafront promenade with the locals. At Panagia you can choose to walk to the nearby village of Agios Dimitrios where the tiny red-roofed houses are dwarfed by the mountains behind them. Alternatively, perhaps you'd prefer to visit the beautiful Church of Panagia renowned for its colourful frescoes and the two ancient olive trees, which are a remarkable 2,500 years old. They are located next to a small stream where you can watch terrapins swimming. Today we will cruise to the limit of the Gulf of Evia, where the island splits from the mainland. Greek legends romantically claim that the divide was caused by the God of the Sea - Poseidon piercing the earth with his mighty trident. We travel via Porto Buffalo - a secluded lagoon surrounded by rolling hills and where we have the chance to swim and snorkel in the inviting warm blue waters. We continue our leisurely cruise to Eretria. This is one of the best known historic cities of ancient Greece and was the birthplace of the Latin alphabet. Eretria was once a city-state and was a huge maritime, commercial and agricultural power and so the city was invaded and destroyed by both the Persians and Romans. Its long history has left a mark on the town, which is still home to an impressive ancient theatre, temples, mosaics and tombs. This evening why not take a stroll and discover the long cosmopolitan promenade which is lined with family-owned tavernas, cafe bars and restaurants. It's an ideal place to sit and watch the world go by including seeing the small ferries coming and going from the mainland. There aren't a lot of shopping opportunities on this trip due to the secluded bays and rustic towns where we moor up. However in Eretria this morning there'll be the opportunity to buy keepsakes and presents to take home; the town is particularly known for its silver and gold jewellery. Alternatively you have the option to discover Eretria's extensive archaeological site and visit its superb museum. Exhibited here are ancient items found around the city and a couple of the most important items on display are a Mycenaean clay vase decorated with griffins and deer, and a terracotta amulet showing a mythical Medusa head. Next we cruise towards Nea Styra, an area of stunning beaches and coastline. The rolling hills above the small town, lead to the silver-green valley of olives. Our boat will be moored near the beach so it's easy to swim between the two and enjoy a relaxing afternoon. Alternatively, there is the opportunity to take a taxi to visit the quaint medieval village of Styra, which is around five kilometres inland. Here you can relax in the village square which is home to old mulberry trees and a mountain spring. Before sunset tonight there's the chance to have a complimentary drink such as sangria on our boat's top deck and watch as the light fades above the shimmering waters of the historic bay of Marathon. As the sun sets the nearby promenade comes to life with locals and visitors alike experiencing the typical Mediterranean stroll before dining al-fresco. Tonight you might like to stay out later to enjoy the nightlife, cocktails and atmosphere in Nea Styra. This morning will see us cruising towards Porto Lafia, a peaceful hamlet where we can swim and snorkel off the boat in the protected and quiet bay. From here we continue to Marmari, of typical Aegean fishing village with numerous small tavernas and cafes dotted along the promenade. There's the option to take an easy coastal walk around the photogenic sand bar (taking about one hour). The waters around here are popular with surfers and attract those with a passion for the sport from around the world. Alternatively, along the beach in the opposite direction (around 30-35 minutes walk) is a nice little canteen on Kokini Beach that serves a great variety of cocktails and is a good spot to relax this afternoon. We cruise to the Archipelagos of Petali, where seven privately owned and exclusive islands offer the wealthy the best of the 'jet set lifestyle' and dropping anchor in the bay we can also enjoy these light Turquoise waters that are more similar in colour to those found around the Seychelles than the dark blue waters normally seen in the Aegean. Once the summer residence of the Greek Royal family, today this is the playground of the Picasso family, the Embiricos family and other shipping tycoons. The famed soprano singer Maria Callas also spent many of her summers here. After a couple of hours spent swimming in the bay we will cruise to Karystos. This is a great place to see real Greek island life with its working harbour having changed little over the years in this authentic market town. You can stroll pass Neo-Classical buildings and charming squares along its wide streets and admire the backdrop of Mount Ohi that rises from behind Karystos. There are also a number of good sandy beaches and rocky coves nearby and there's the option to take an easy walk along the coast (covering around four to five kilometres) this afternoon. This morning is free to relax in Karystos or alternatively to take a taxi/coach ride up to the base of Mount Ohi to visit the Venetian mountain castle of Castello Rosso in Gourna, which is a walled 13th century Crusade fort that commanded the sea corridor between Asia and Europe - the entry point to the Black Sea. From the castle there are excellent panoramic views back over the coast. This afternoon we cruise to Bouros in the Karystos Bay where we drop anchor to enjoy our last opportunity to swim and snorkel before we sail back to the town of Karystos, where we spend the night in a small waterfront hotel. Tonight we will have the chance to taste the Islands organic desert wine after dinner in one of the waterfront restaurants. Departing Karystos this morning we take a short taxi or minibus ride back to Marmari or Styra to board the ferry for the journey back to Rafina or Marathon on mainland Greece. Our ferry will depart at approximately 9.50am. From Rafina we transfer to Athens International Airport, where we will arrive at about 11.30am and this is where our trip ends. On day one depending on your flight arrival time you might have the opportunity to go into the city centre before the joining time of the trip. A metro ticket from the airport is approximately €18.00 per person return and luggage storage is available at the airport for €5.00 per locker. Styra village visit on day four (by taxi) is €10.00 per person. Eretria Archaeological Museum entrance on day four is €2.00 per person and you'll have around two hours here. Castello Rosso (by taxi/coach) is €20.00 per person. Bar prices on board the caique are very reasonable and are approximately: mineral water €0.50, soft drinks (fizzy or juice) €1.50, €1.50 large glass of wine (red, white or rose - all locally produced) or ouzo mixed with water, €2.00 can of beer (Mythos or Fixx - local Evia beer) and €3.00 spirits such as whiskey, gin, vodka, rum, brandy, metaxa (rose flavoured local spirit) and mixer. All optional excursions must be paid for in cash and on board the caique payments can be made in cash in GBP or Euro. Most tavernas accept credit cards as well as cash payments. July and August are the hottest months, though the island is freshened by cooling winds. It's best to pack lightweight cotton or breathable clothing and then a warmer layer for the evenings. Early and late in the season, there may be an occasional shower so it's best to pack an umbrella and light rain jacket and you will need a warmer sweater or fleece for the odd chilly breeze whilst we travelling between the ports and for the evenings. Footwear is not generally worn on board the caique but bring trainers or walking sandals for shore excursions or lightweight walking shoes for longer walks on the island. Generally shoes for swimming not required as the seabed and beaches are either fine pebble or sand and sea urchins are not commonly found. Space is limited on board and your main luggage will be stored underneath your bed, so please only bring what you need. A soft sided bag is strongly recommended as it is more easily stored than a hard suitcase. It is advisable to bring a water bottle, personal first aid kit, torch (in case of emergency), sunhat, sunglasses and water-proof high factor sun tan lotion. There is plenty of time to relax whilst aboard the caique and so you might like to bring a good book, pack of playing cards or a quiz book. There are also plenty of chances to go swimming and snorkelling. Goggles, snorkel mask, flippers and swimming aids are all available on board, but you may prefer to bring your own. Swimming gear and also a towel are a must. You may consider wearing a T-Shirt or rash vest whilst snorkelling to avoid sunburn to your back and shoulders. If you intend to sleep out on deck on some nights, as many travellers choose to do in good weather, then you may want to bring a sleeping bag with you (the sunbathing mats are available to sleep on but cabin bedding can't be taken on deck). It is however normally warm enough at night not to need a sleeping bag. The areas that we cruise are normally pretty calm, but if you do suffer with sea sickness then bring anti-sickness medication with you just in case. Although entirely voluntary, tipping is a recognised part of life in this region of the world. Some local staff will look to members of the group for personal recognition of particular services provided. Please allow £15.00 for tipping the boat crew at the end of the trip. Spend six nights aboard the historic listed family-owned traditional wooden motorised caique - MV Isidoros II. This boat is exclusively chartered by Explore and has a maximum capacity of 19 people which includes the crew and our leader, Thanos. Although our boat does have sails it will primarily run on engine power, but as long as the weather is good then the crew will get the sails out to show you and run on them for a short time. The caique was only ever designed for the sails to be a back-up should the engine fail and its shape is reminiscent of that of the ancient Greek rowing ships. We have been operating this trip for many years now and have found that a number of our customers choose to come back and do the trip again. One of the main reasons they give for this is the excellent hospitality of the crew on board our caique who help to make the trip feel all the more special. Our boat has a large sundeck on the bow and space to sunbathe on the top deck, a cool and airy indoor galley and dining room, shady spots outside under a canopy, and a boat ladder for swimming. Sunbathing mats and snorkelling gear are provided. A safe for your personal valuables is available in the wheelhouse. Complimentary Wi-Fi is available on board at all times. There are two double cabins on the main deck and six twin cabins on the lower deck. Cabins and bathrooms have windows that open (not portholes) and all cabins are en suite with a shower, sink and toilet. The cabins are cosy and can get warm in summer as (there is no air-conditioning due to the historic listed nature of the vessel), but each is equipped with a large fan that is on 24-hours a day or if you prefer, it's also possible to sleep on deck under the stars and take in the refreshing sea breeze. All cabins have a power socket (European two pin round plug), as does the galley for charging personal appliances. The plugs can be used when moored but not when cruising. In terms of bedding - pillows, a blanket for spring and autumn departures or a lightweight sheet in summer are provided as well as a bath and face towel, which are all changed mid-week. Between the floors of the caique are quite steep ladder type stairs with hand banisters. Vegetarians can be catered for on board, but please do let us know of any dietary requirements at the time of booking. The plastic used on the boat is recycled by the crew and the water on the island is drinkable, so Thanos will ask for jugs of water to be provided during dinners in the tavernas. Life jackets are stored under the sofas in the galley (there are 25 adult and 15 child life jackets on board). Life boats are located on the main deck (three boats that each hold 10 people). On your arrival day, depending on your flights you may have time to wait at the airport ahead of our group transfer to Evia. You can make the most of this by taking the opportunity to explore the nearby city of Athens, which is easily accessible from the airport on regular metro trains - the signage is in English and no changes of train are required. There are also luggage storage facilities available at the airport. In the waters around the Petali Islands we can't go onto land but we will drop anchor and go swimming in the bay for a couple of hours. The currents here are stronger than other places we dock at, so you need to be a good swimmer. There will be a line attached between a buoy and our boat to assist you. There is no shortage of swimming opportunities during this trip and on the Evia's beaches the use of sun loungers is free of charge. There are few other tourists and so the beaches aren't overcrowded. Uncover traditional Greek culture and food, swim, snorkel and relax on our unique caique boat cruise around the quiet coves, beaches and harbours of Evia. 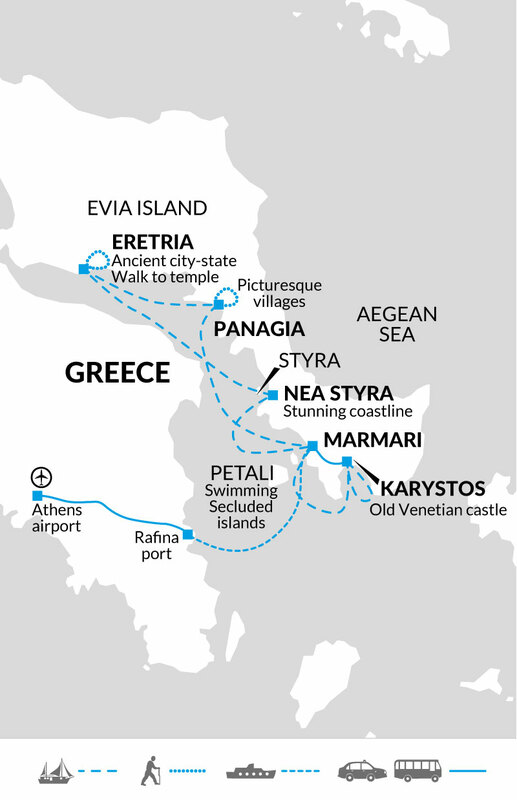 It's then easy to understand why cruising in Evia has been listed on National Geographic's Top 10 Cruising Holidays of a Lifetime for several years running.